Arthur Streeton was born at Mt Duneed, Victoria in 1867, and was one of the key members of the Heidelberg School. Like many of his contemporaries, Streeton sought to develop his career in Europe after early success in Australia, and moved to London in 1897 where he remained for more than 20 years. As a young man Streeton had trained as an apprentice lithographer in Melbourne (George Troedel and Co, from 1886-88) but did not make his own prints until he had been in London for more than a decade. In a letter to art collector Baldwin Spencer on 8 January 1913, Streeton enthused about Rembrandt etchings he had viewed in the British Museum, and commented on the profitable market for contemporary prints in London (A Galbally and A Gray, 'Letters from Smike' p.124). An interest in making his own prints was sparked and he went on to create a number of etchings and lithographs. Streeton is known to have made six editioned lithographs of English and Venetian scenes which he exhibited in April 1913 at the Ballie Gallery, London. Four of the lithographs were included in a 1925 exhibition at the Fine Art Society in Melbourne. It was noted in the catalogue for this show that the lithographs were printed in an edition of 12 by Thomas Robert Way (1861-1913), Whistler's lithographer, however, the printer is more likely to have been H P Bray, a skilled lithographer who worked for Way's firm. Streeton embarked upon a cycling trip through Dorset in the summer of 1909 with his friend, artist Tom Roberts. While on the tour Streeton made a series of paintings of the ruins of Corfe Castle, an ancient fortress that had been partially destroyed during the English Civil War in 1646. 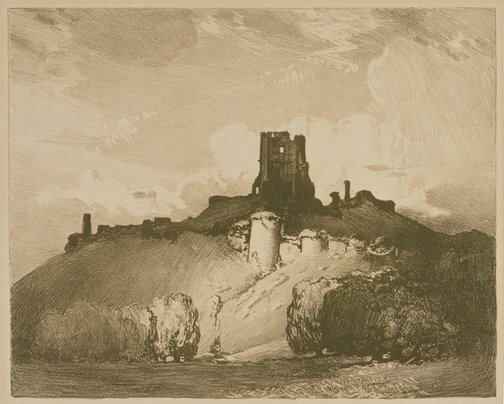 The lithograph Corfe Castle is after a 1909 painting of the same name which Streeton exhibited at the Royal Academy in 1910, now in the National Gallery of Victoria collection (see G Smith Arthur Streeton 1967 - 1943 NGV, Melbourne, 1995, cat no. 64, p. 151). Signed l.r. corner., printed "AS". Not dated.